Just as people have different skin and hair color, people also have different tooth color. Some teeth are more yellow, and others yellow with aging. Natural tooth color can be discolored by a number of causes. The surface of the teeth can be stained by tobacco, certain foods and beverages such as coffee, tea and berries and by deposits of calculus, or tartar. Discoloration of the tooth internally can result from aging, injury, excessive fluoride, certain illnesses and taking the antibiotic tetracycline during early childhood. Although bleaching successfully lightens most discolorations, certain types (those caused by tetracycline) are more difficult to remove. There are two types of bleaching procedures. 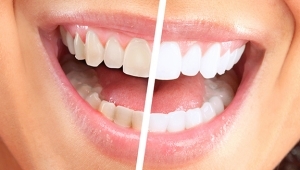 Bleaching may be done completely in the dental office (known as chairside bleaching) or a system may be dispensed by the dentist for the patient to use at home (home-use bleaching). The procedure that is done in the dental office takes from 30 minutes to one hour per visit. It is not uncommon for the teeth to become slightly sensitive following bleaching treatments. With home-use bleaching, the dentist makes an impression or a model of your teeth, fabricates a custom-fitted mouth guard and prescribes a bleaching agent that comes in the form of a bleaching gel. The gel is placed in a mouth guard and worn up to two hours daily or at night for about two weeks. The amount of time the mouth guard is worn and the duration may vary according to your needs and your dentist’s recommendations. Some people with certain dental conditions may not be good candidates for this type of bleaching. People with gum recession, for example, may have exposed root surfaces that are highly sensitive that could be further irritated by the ingredients in whiteners. In addition, these products are not recommended for habitual tobacco and alcohol users. If you have had tooth-colored crowns, bonding or composite restorations placed, talk with your dentist, since these materials will be a different shade of color than newly bleached teeth. Tooth bleaching doesn’t require any tooth structure to be removed, as do some other procedures to whiten teeth, and it’s also the most economical. To get the best results, teeth may be bleached a shade lighter than desired since they will tend to darken slightly with time. Anywhere from two to ten visits may be necessary to complete the process of chairside bleaching. Home-use bleaching is normally intended to be completed in two weeks. Most bleaching lasts one to three years, although in some situations it may be longer. Your dentist will monitor the entire process of home-use bleaching to ensure its effectiveness and safety. Over-the-counter products that are self-administered are not recommended. Although they may appear to cost less, bleaching treatments should only be done under the supervision of a dentist following a proper examination and diagnosis of the discolored teeth. Whiteners with the ADA Seal of Acceptance have proven to be safe and effective. With some chairside techniques, you should avoid stain-causing beverages such as coffee and tea for several days after e procedure, because your teeth may more readily absorb stain at that time. Twice-daily brushing, daily flossing and regular professional cleanings – along with occasional touch-up treatments – will keep your teeth white so that you can again feel confident in exercising your smile!